Passengers flying into Fort Lauderdale-Hollywood International Airport can find their way around the airport to find a quick snack, parking and ground transportation. Looking out at the North Atlantic, Fort Lauderdale is a sunny beachside city that's great for business and even better for pleasure. Make sure your trips run smoothly by taking every step in stride, especially if you're walking through the very-busy Fort Lauderdale -Hollywood International Airport. With a slue of parking opportunities, spacious retail shops, and a diverse pallet of eateries, you'll be swimming in convenience. With a tons of places to see comes an equal amount of areas to leave behind. Make sure your vehicle is in good hands by picking a nearby lot, whether it's at curbside valet, located at terminals 1, 2, and 3, or a reserved online space at one of the two garages. Download the FLL Airport App for real-time parking availability, directions, and tons of other helpful features. 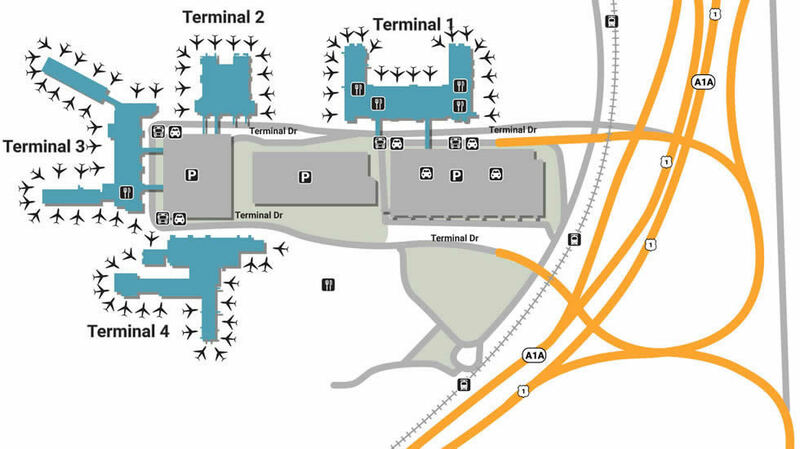 Long-term travelers in need of economy parking should head to 42nd and Ravenswood while daily/hourly parkers should head for either the Palm Garage or the Hibiscus Garage, both of which are located to your left while driving through Terminal Drive's entrance. From the ordinary to the extraordinary, FLL services aren't just simple and accommodating, but a grave importance to a lot of travelers. From simple luxuries like free Wi-Fi scattered across the facility to telephones available at baggage claim, pretty much everything is at your fingertips. Emergency medical services are also available throughout the terminals in the form of encased defibrillators. If you're traveling with your pet, make sure they're nice and comfortable before boarding by taking them to one of four pet relief areas located outside Terminal 1 as well as outside the Palms Garage near Terminals 2, 3, and 4. If you're stuck in the lobby with nowhere to go, explore the many shops and services in Terminal 1, whether it's something as normal as picking up your local paper at a Hudson News stand (Arrivals) or browsing through the wide array of electronic devices and accessories available at Tech On the Go (Concourse C). Explore even more news at Terminal 3, which is home to the CNBN News & Gift Shop as well as two Tropical News Kiosks. If you're in need of a quick upscale gift, visit the Broward Duty Free Shop for brand-name products, located in Terminal 3, Concourse F.
A variety of restaurants can be found at Terminal 1's Lower Level Baggage Claim. Make your morning interesting by grabbing a bite to eat at Great American Bagel, famous for serving oversized treats with dough made from scratch. If you're in need of a downer at the end of the night, grab a cold one at the Lime-a-Rita bar, a great place to go for a fresh happy hour and lunch. You can also eat fresh by walking over to Terminal 2's Food Court, enjoying a famous hotdog at Miami Grill or a farm-fresh salad at Urban Market.